Canberra, it’s time we had a Wintervention. As the temperature plummets outside, symptoms of cold fingers, runny noses and visible breath are reported daily. Never fear, we have a cure to warm up those frosty fingers. With snow loads of winter activities, belly warming treats and entertainment to delight, we’ll make sure your winter is a warm one. Our city transformed into a winter wonderland. A car park turned into a Pocket Park. Create-a-space areas in the city - there are three to be found. At the World Curry Festival on 13, 14 & 15 July. At Eat Feast running from 29 June – 23 July. Skate on the ice rink. See a circus show at the La Petit Grand Spiegeltent. Come along to Hurly Burley Winter Fair on 2 June. Enjoy inflatable and carnival rides. Enjoy One Sunday in the City . Take part in World Wide Knit In Public Day. The always popular pop-up skating rink is back in the city centre in 2018. And for those who want something other than skating there'll also be an ice slide, jumping castle and carnival rides, including a Ferris wheel. Light Landscapes is a participatory installation coming to Canberra across the first weekend in July (Friday 6 July - Sunday 8 July). There will be over 2,500 candles that make up the installation. You can see the installation on City Walk between 5pm and 9pm each night. Three temporary sculptural installations in the city precinct have created new places to meet, chat and enjoy life. Hurly Burley Winter Fair, presented by Little Dove Theatre Art with the support of City Renewal Authority via the City Grants program was on Saturday 2 June 2018. Poets for Breakfast is a two-morning event that provides an opportunity to start your day with poetry and music in the heart of the city centre. Trove Canberra wants to fill Garema Place with knitters, crocheters, weavers, spinners and stitchers of all kinds on World Wide Knit In Public Day. This is the 4th year that Trove Canberra will host a Knit in Public and each year it just gets bigger and better with a City Grant. 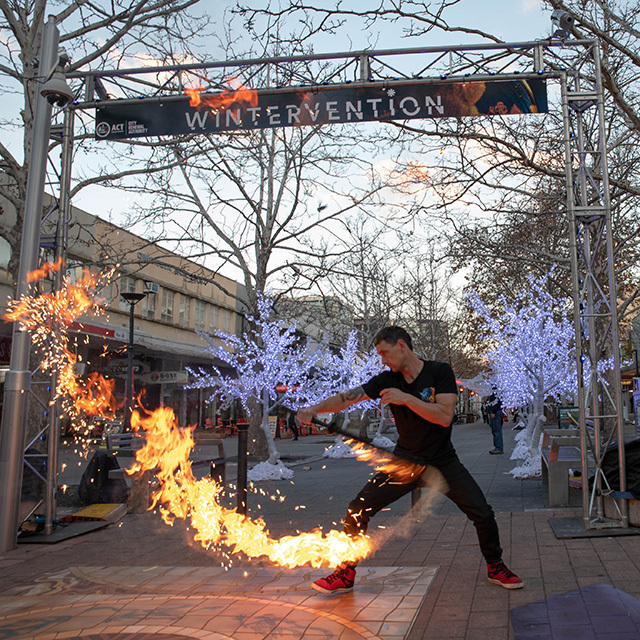 Garema Place and City Walk will be filled with things to see, hear, taste and experience from tonight (Friday) as the Wintervention program hits full swing. A winter forest, fire performances, live music, artistic candle installations and inflatable amusements will be in place from tonight to complement the already popular ice skating and sliding activities. Winter Wonderland Circus shows and other performances will also start from tomorrow in the Le Petite Grande theatre tent. City Renewal Authority chief executive Malcolm Snow said Wintervention’s extra activities and themed installations made this winter in the city centre more exciting than ever before. “Having a real winter is something Canberra has that most other Australian cities don’t, so it’s important we make the most out of it,” Mr Snow said. “Wintervetion provides a little extra incentive to put on some warm clothes, get out of the house and be part of the community in the heart of the city. A live music stage will feature local musicians over the weekends, beginning tonight at 6.30pm with Slow Dial, Betty Alto, The Get Downs and Endrey. A fire extravaganza performance will start at 6pm tonight, with repeat performances, roving fire performers and lantern workshops also taking place over the next three weekends. “This weekend will also feature a large public participation candle installation in City Walk by artist Kristian Baggerson,” Mr Snow said. “Kristian will be creating three different designs over the next three nights, each using 2500 candles, and needs the community’s help to really make these as big and bold as possible. Ice skating will return to the city centre this winter to headline Wintervention, an events program that will keep people active and entertained during the chilly months. City Renewal Authority chief executive Malcolm Snow said Wintervention would include a mix of old favourites and new activations. “Ice skating, the popular Hurly Burley Winter Fair and the World Curry Festival will be back again this year, but we also have some great new events and installations to keep the city centre buzzing during winter,” Mr Snow said. “It can be difficult to get motivated to be out and about when the temperature dips, so our Wintervention is designed to remind people there’s plenty to do in the city centre, even when it’s cold outside. Starting with the Hurly Burley Winter Fair tomorrow night (Saturday 2 June) the City Renewal Authority has funded a number of activities, events and installations in the city centre throughout the next few months. “These interventions are designed to increase activity in our public spaces to complement the many entertainment, dining and retail attractions that exist in the city centre,” Mr Snow said. “There’s already a lot to do in our city centre and by activating its public spaces we're providing more incentives for people to come out and enjoy themselves. Additional events and activations will be added as details are finalised.